ARCANE PUBLISHING is a small independent publishing imprint founded in 2012 primarily to publish novels by Carya Gish. We love telling stories and we have a passion for beautiful books! We publish stories which are modern yet infused with an acute sense of history and the importance of the past: our own, but also that of the society and the world we live in. Our publications also reflect our love of the arts, music and literature. Miss Gish has firmly positioned herself within the ‘Occulture’ coined by writer and academic Robert Macfarlane in his article The Eeriness of the English Countryside. If you would like to know more about them, please go to their individual pages on the menu at the top of the page and/or check Carya Gish's WEBSITE. You can read reviews and features about I Am a Muse HERE. You can purchase our books at the unit we share with designer Matt ArtPix at The Customs House, West Bay, Dorset. Arcane Publishing has an online shop HERE. We also attend events where we sell our new and second-hand books. See our EVENTS PAGE for more details! MORE EVENTS ADDED TO OUR EVENTS PAGE! Set in Shoreditch in London and Cornwall, I Am a Muse is a novel about art, inspiration, ageing, choice, free will, loss, passion, insanity, the multiplicity of the self; it also deals with different types of claustrophobia (both psychological and physical). This is Arcane Publishing’s next publication and is set in Dorset. It is inspired by PJ Harvey’s song The Wind, by the book Secret Places of West Dorset by Louise Hodgson and by the landscape, history and legends of the county. The cover artwork, which represents St Catherine’s chapel in Abbotsbury, is by local artist Sam Cannon. The novel even has a playlist! ARCANE PUBLISHING is a small independent/DIY publishing imprint created primarily to publish novels by Carya Gish. Arcane Publishing also sells second-hand books. We have a great stock of books about music, cinema, music-hall, theatre, general popular culture, history and social history, fashion, beauty... A lot of them are hard-to-find volumes! 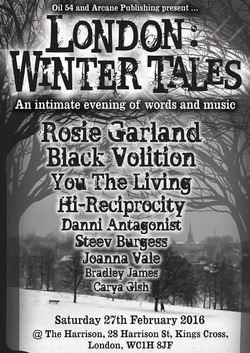 On 17th February 2018, Oil54 and Arcane Publishing organised LONDON: WINTER TALES - THE WITCHING HOUR ! This was the follow-up to our first (and dare we say sold out) event in February 2016 (see below). We had a fabulous cast of writers and musicians! So if you wish to join us, go to the event's page HERE to read more about what we have in store for you! You can read a review of the event HERE . All the "official" pictures by SteveK Photography are HERE. More events to be announced soon! Keep an eye on the events page! On 27th February 2016, we co-organised and hosted an evening of poetry, literature and music in London. Find all the necessary details, a great review and a link to the interview booklet featuring all the artists on our events page HERE.